Well isn’t this just delightful. 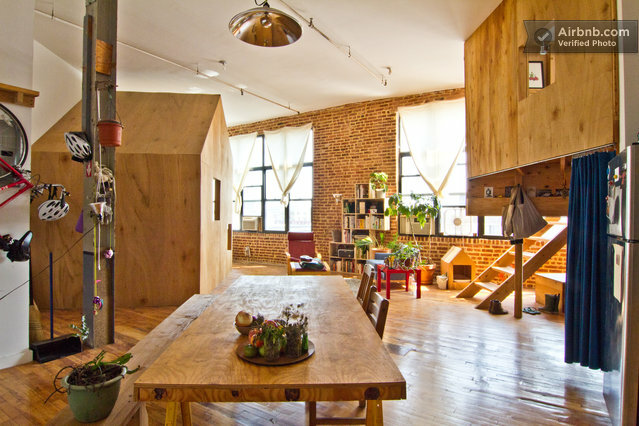 A Brooklyn couple built a tiny, one-room cabin inside their apartment, and now they rent the place out on Airbnb. They call it a “one room bed and breakfast”. 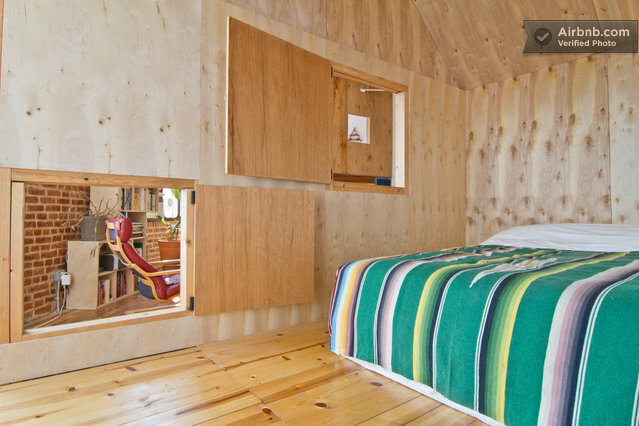 There’s also a lofted “treehouse” space, where the couple sleeps, which is also available for rent. How nice would it be to have your own little cabin to go home to after a long day exploring the city? The cabin comes highly-reviewed on Airbnb, by the way, and it’s a helluva lot cheaper than even a mediocre hotel. In other news, wedding planning has swallowed me whole. Hey guys, turns out it’s pretty crazy to try to get married in under five months… who knew?? Pictures courtesy of Airbnb, first seen here. Another home, another city. I must be honest (and I know I’m going to catch a lot of flack for this): I hate New York. I know, I know, greatest city in the world, blah blah blah. But I’m skeptical. This Onion article kind of speaks to my heart. I mean, I know that New York is home to all kinds of amazing food, and hidden gems, and bizarre secrets. But somehow, whenever I visit, I get so distracted by the sheer number of people all in such close proximity to me. New York is not an ideal destination for someone with severe crowd anxiety, such as myself. But maybe if I had my own home, my own respite from the strange smells and the hard pavement and the throngs of people, maybe New York and I could finally start the love affair I’ve always known we deserve. I’m thinking a spacious brownstone in Brooklyn, or perhaps this delightful neighborhood. It place would be all eclectic glamour, but nothing stuffy: a gorgeous but cozy place with a loft for reading and a giant kitchen where everyone could hang out and drink wine and laugh. Because the most alluring part of New York, for me anyway, is the fact that most of my friends live there. Living on the other side of the country, I miss them all terribly, and my imaginary Brownstone would be the perfect place setting for wild dinner parties and games of apples to apples and oh, the cheeseplates we would have. More homes to come next week, but in the mean time be sure to check out my Pinterest for more dream pads.